New players can earn 100% up to £300. 150x the deposit plus bonus must be wagered. Bonus must be cleared within 7 days. The 100% up to £300 William Hill bonus can be cleared by playing craps. This requires a 150x WR to be cleared on both the deposit and bonus. This means for the full £300, you must wager (£300 + £300) * 150 = £90,000 before cashing out. If you’re averaging £10 per roll, it would take you 9,000 rolls before the bonus is fully cleared. The £300 bonus is non-cashable, meaning when you process a withdrawal, it will be removed from your account. Bonus expires in 7 days so must be cleared within that time period. No bonus code is required on a deposit; bonus is automatic on first deposit. Intertops rewards new craps players with a 100% bonus up to $100 by using the code SIGNUP100. In order to clear the bonus funds, you must wager 30 times the deposit amount plus the bonus amount. However, wagers on craps only count 35% towards clearing the bonus. Therefore, craps players must wager an amount approximately equal to 86 times the deposit + bonus. If you decide to take full advantage of this bonus by depositing $100 to receive a bonus of $100, then you’ll have to wager ($100 + $100) * (100/35) * 30 = $17,142.86 before requesting a withdrawal. If you place bets averaging $5 per roll of the dice, then you’ll need to play 3,429 rolls before you have cleared the bonus. There’s no expiration on this bonus, so feel free to take as long as you need to clear it. Ladbrokes offers a 100% up to £500 deposit bonus for new players. This bonus requires the deposit and bonus to be wagered 20 times, and craps only counts for 25% of the requirement. This means the effective craps wager requirement is 80x. By making a deposit of £100, you would earn a £100 bonus and thus be required to wager £200 * 80 = £4,000 playing craps before the bonus is cleared. 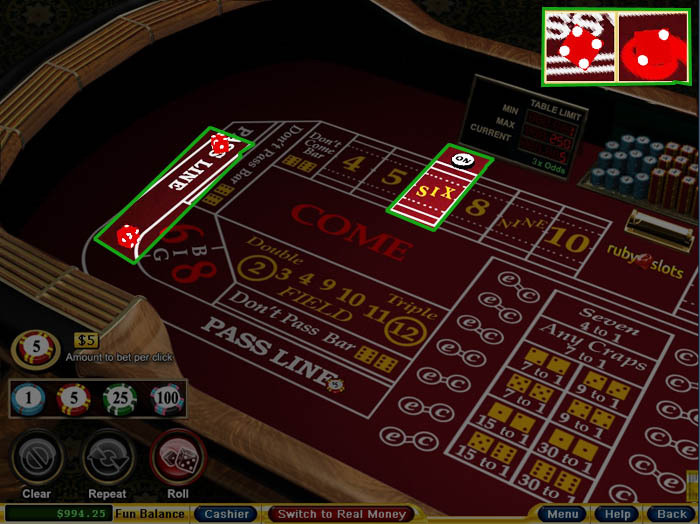 Craps is a casino game in which one player, known as the “shooter,” rolls a pair of dice. The shooter and other players bet on the various combinations of the die rolls. While simple in its essence, casino craps offers dozens of different bets that can be placed with varying odds for each one. 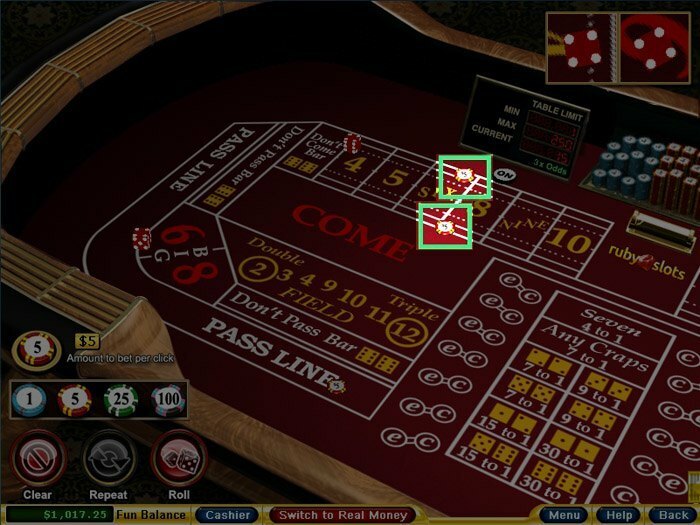 In live casinos, there is a complex series of written and unwritten rules that affect the flow of the gameplay, but in an online setting most of these things are either irrelevant or are handled automatically by the game server. The first roll made in a round of craps is called the “come-out” roll. 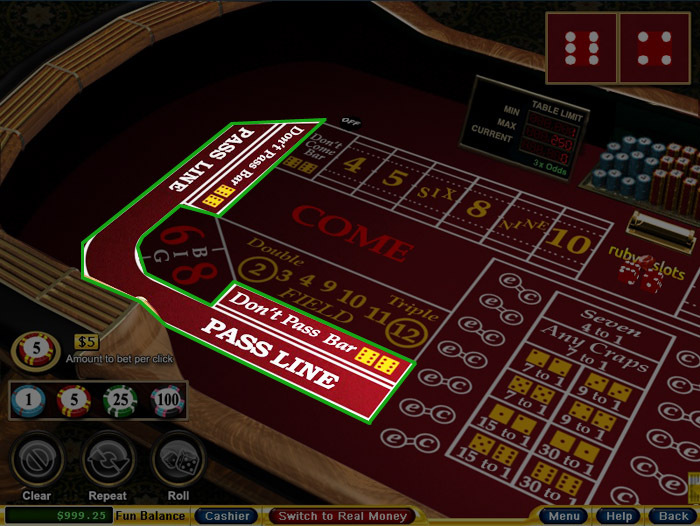 Players bet on the “Pass” line or the “Don’t Pass” bar and then two dice are thrown for the come-out roll. The total number of pips showing on both dice are added together. If the result is a 7 or an 11, then the Pass line bettors win an amount equal to their wagers while the Don’t Pass bar loses. If the come-out roll is a 2 or a 3, then the Pass line loses and the Don’t Pass bar wins. If the come-out roll is a 12, then the Pass line loses while the Don’t Pass bar pushes. Rolling a 2, 3 or 12 is called “craps” while a 7 or 11 on the come-out roll is called a “natural.” If any of these rolls – 2, 3, 7, 11 or 12 – occurs on the come-out roll, then the round is over and a new come-out roll takes place. Standard craps table. Note the Pass line and Don’t Pass bar at the bottom and left-hand side.If any other number is rolled – 4, 5, 6, 8, 9 or 10 – then that number becomes the point. 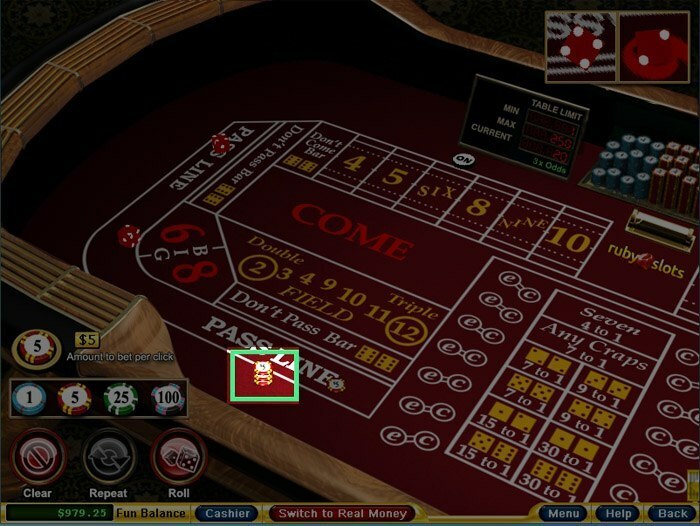 The dealer will place a button on the table next to the point value so that everyone will know what it is. The Pass line has a house edge of 1.41% while the Don’t Pass bar has an edge of 1.36%. The Pass odds and Don’t Pass odds are some of the best bets in craps. After the point is established with the come-out roll, Pass line bettors have the opportunity to bet an additional sum on the point being rolled before a 7 comes up, called “taking the odds.” Similarly, anyone who has bet on Don’t Pass can wager extra money on a 7 coming up before the point, which is called “laying the odds.” What makes these bets especially favorable is that the odds are adjusted depending on the point and are exactly the same as the true odds of the event occurring. This means that there’s no house edge on this type of bet. Because of the breakeven nature of these odds bets, casinos have a limit to the amount you can bet on the odds to prevent people from betting the minimum on Pass/Don’t Pass and then flipping coins against the casino for thousands of dollars. Players can usually only bet on the Pass and Don’t Pass odds if they have already made a Pass or Don’t Pass bet, and they are limited to a multiple of their initial Pass or Don’t Pass wager amount. After the come-out roll, the player has taken the odds by placing $15 next to the pass line (outlined in green). Notice that the placard on the table states “3x Odds,” which means that a player is restricted to a maximum odds bet of three times the Pass/Don’t Pass bet. Two wagers that are similar to Pass and Don’t Pass are Come and Don’t Come. These two wagers can only be made after the point has been established with a come-out roll. A Come bet is roughly analogous to a Pass bet – the bettor wins if a 7 or 11 is rolled on the next roll and loses on a 2, 3 or 12. The Don’t Come bet will win if the next roll is a 2 or 3, loses if it’s a 7 or 11 and ties on a 12. If neither 2, 3, 7, 11 nor 12 comes up on the next roll, then a point is established by the total of the dice. This point has nothing to do with the point established in the come-out roll; this come point is used solely for the purposes of this specific bet. If a 7 is rolled before the come point, then the Come bet loses while a Don’t Come bet wins. If the come point is rolled first, then the Come bet wins, and the Don’t Come bet loses. Just like with regular Pass line and Don’t Pass bar bets, you can play Come and Don’t Come odds, which have a 0% house edge. These wagers are typically governed by the same betting limits as the Pass and Don’t Pass odds. With a Buy bet, you can bet on any one of 4, 5, 6, 8, 9 or 10 to be rolled before a 7. A Lay bet allows you to wager that a 7 will be rolled before a specific one of 4, 5, 6, 8, 9, 10. These bets pay out at true odds, but a 5% or 4% commission is charged by the casino. The way that these commissions are calculated varies from place to place. A Place bet is similar to a Buy bet: You are wagering that a specific number will appear before a 7 comes up. The Place to Lose bet is the converse; you’re betting that a 7 will appear first before the specified point. Unlike Bet and Lay bets, the Place and Place to Lose wagers do not charge commissions. Instead, they pay out at slightly worse than true odds. Big 6 and Big 8 are wagers that the specified number will appear before a 7 is rolled. These bets pay out at even money, making them worse than typical Place bets on either the 6 or 8, which pay out at a better rate. It’s possible, though not recommended, to play Big 6 or Big 8 by placing chips in the green outlined area. 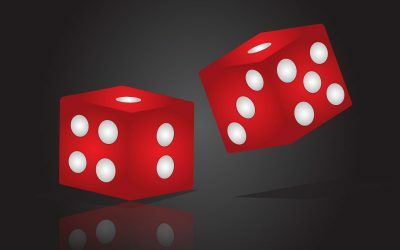 There are some special considerations you should be aware of when placing bets that can remain active for several rolls of the dice. In some cases, players are able to add to or subtract from their wagers in between rolls. They cannot do so with every wager, as this would allow them to manipulate the house advantage for multi-roll bets too much. Typically, players can add to wagers that favor the house but cannot subtract from those wagers. They can subtract from wagers that favor the player but can’t add to them. Buying and laying the odds on Pass/Don’t Pass or Come/Don’t Come are usually wagers where the player can either increase or decrease their bet after any roll since these bets favor neither the player nor the house. In most brick-and-mortar casinos, certain bets – especially Come and Don’t Come – are “turned off” if they are not resolved by the time the shooter makes his point or sevens out. They are said to be “not working” for the new come-out roll and will merely sit on the table for that roll. Once a new point is established, the bets are turned on again and will pay out according to their normal rules. Sometimes, a player can request that a bet remain on for the come-out roll. Online, different casinos have different rules about when and how bets are working or not working. You may wish to consult the rules posted at your casino for more information. Betting on a specific number: 2, 3, 4, 6, 8, 10, 11 and 12 are usually allowed. For 4, 6, 8, 10 and 12, the total must be achieved with both dice showing the same number. Each result has different payouts associated with it. Field: A field bet wins if the next roll is a 2, 3, 4, 9, 10, 11 or 12. It usually pays out at even money, but a 2 normally pays double and a 12 often pays triple. Any craps: This wager pays off if a 2, 3 or 12 comes on the next roll of the dice. Any seven: Pays out if the next roll is a 7. Place your proposition bets within the area outlined in green. There’s no real gameplay strategy involved in craps. Instead, all outcomes are determined by the rolls of the dice. Nevertheless, you can set yourself up for success by learning which wagers have a lower house edge than others. This will allow you to extend your time at the table and minimize your losses. The Pass line and Don’t Pass bar have some of the best odds at the table, with a 1.41% and 1.36% house edge respectively. But the biggest advantage to playing these bets comes from the fact that you’ll be able to take/lay odds with 0% house edge after the come-out roll. Because of the lack of house advantage on the odds, casinos often limit your odds wagers to a multiple of your Pass/Don’t Pass bet. It’s extremely beneficial to find a casino that has a high limit and to always play the maximum on the odds. Mathematically, Come/Don’t Come and the associated odds bets are identical to Pass/Don’t Pass, so they are also good bets for you to make. Remember to put as much on the odds as you are allowed to and are comfortable with. The various Buy, Lay, Place and Place to Lose wagers are not as good as the Pass line and Don’t Pass bar. The house advantage varies from about 1.5% to around 7% depending on the specific type of bet, the number bet upon and the payoff chart at your casino. As far as the proposition or single-roll bets go, they are some of the worst bets available with edges for the house often higher than 10%. The Field bet is usually the best one as its house advantage is only 2.78%. Beware betting on a 2 or 12 to come up on the next roll as you’ll be giving up a 13.89% advantage for the privilege. The single worst bet at a craps table is usually wagering on a 7 to appear next. The house edge on this bet is a whopping 16.67%. 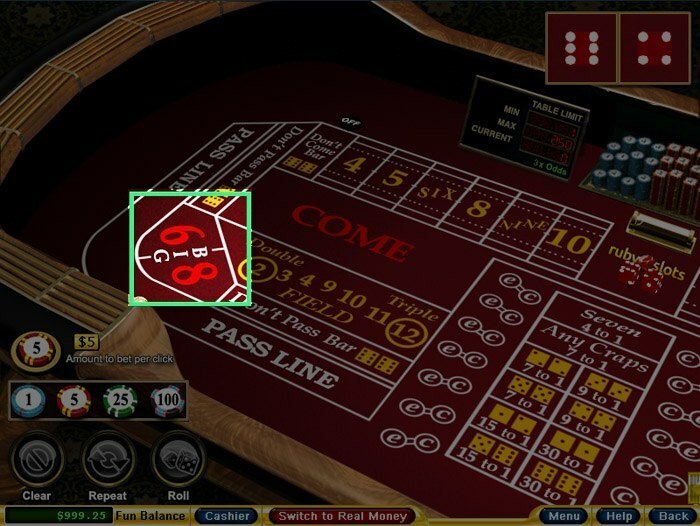 While most of the tricky aspects of running a craps game are handled automatically if you play online, there are a few things to remember if you should venture into a live craps table at a traditional casino. Players take turns rolling the dice as the “shooter.” One player will begin with the come-out roll, and if a point is established, that player will continue rolling until he hits the point or sevens out. Then he will pass the dice to the next player in line. In order to participate as a shooter, a player must usually place a Pass or Don’t Pass bet. If someone doesn’t want to shoot, he or she can decline, and another player will take the dice. 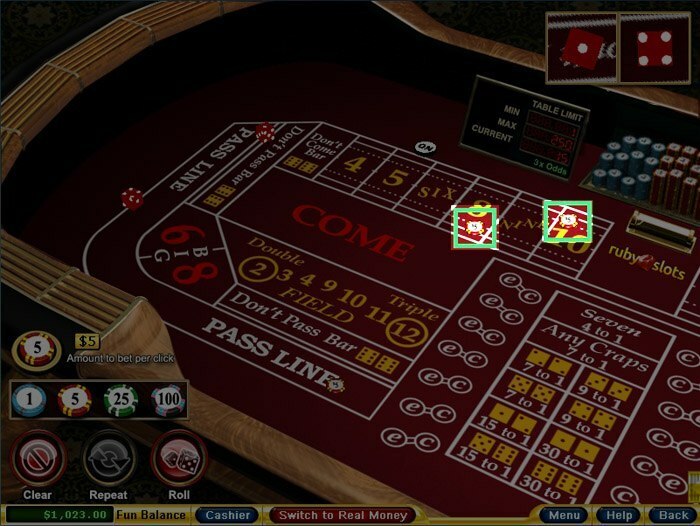 Because craps features dozens of possible wagers and often attracts a raucous and excited crowd of players and spectators, the game is usually run by a crew of multiple people. Usually, there’s a boxman supervising the whole game, a stickman (armed with a stick for moving the dice around) and a couple of dealers present. In most cases, you will not be placing your wagers directly where they need to go. Instead you’ll place the chips on the table and instruct the appropriate personnel what you wish to bet on. Remember to never hand your chips directly to the casino staff; instead place them down in front of you and communicate what you want to the dealers. If you plan on playing on Don’t Pass or Don’t Come, you’ll be going against the grain as the overwhelming majority of players bet on the Pass line. This means that you’ll be acting contrary to the way the table is playing – in fact, betting on Don’t Pass is sometimes called “playing on the dark side” or being a “wrong bettor.” If you over-enthusiastically celebrate your Don’t Pass wins, the rest of the table may look at you askance, but you should have no problems if you just quietly collect your winnings without a big hullabaloo. After a point has been established, it’s considered extremely poor form for players to speak the number “seven” aloud for any reason. Popular nicknames for 7 include “red” and “big red,” which can be spoken without violating this taboo. 2: Called “snake eyes” due to the resemblance of the two pips on the dice to a pair of eyes. 4, 6, 8, 10: Referred to as “hard four,” “hard six,” etc. when the total is achieved by rolling a pair of the same number. 4, 6, 8 or 10 rolled any other way is called “easy four,” “easy six,” etc. Statistically, there are few combos of rolling any specific number the hard way and many combinations of making it the easy way, which may be why they are so named. There are many other ways of referring to these and other dice totals. There is some regional variation, and individual stickmen have their own favorite calls. If you’re ready to sample the excitement and fast-paced action of online craps, you’ll want to deal with a well-established firm that has proven itself by keeping customers satisfied year after year. FlopTurnRiver recommends that you check out William Hill, which has been in the online gambling business since the year 2000. 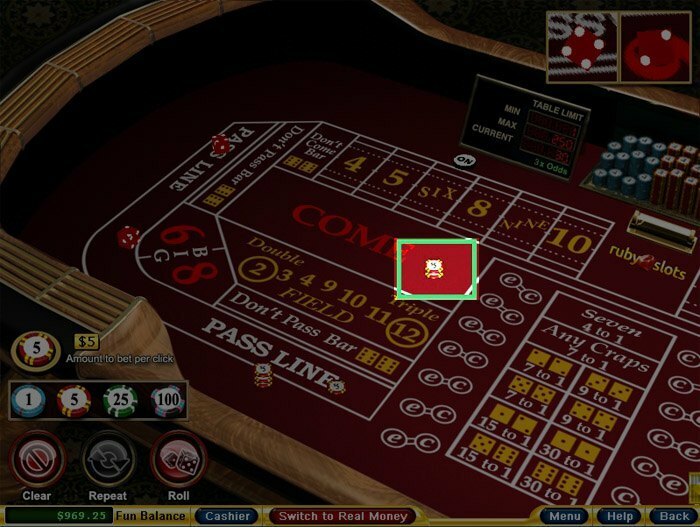 In addition to the craps tables that you crave, you can partake in more than 150 other games, powered by the sophisticated Playtech casino software. 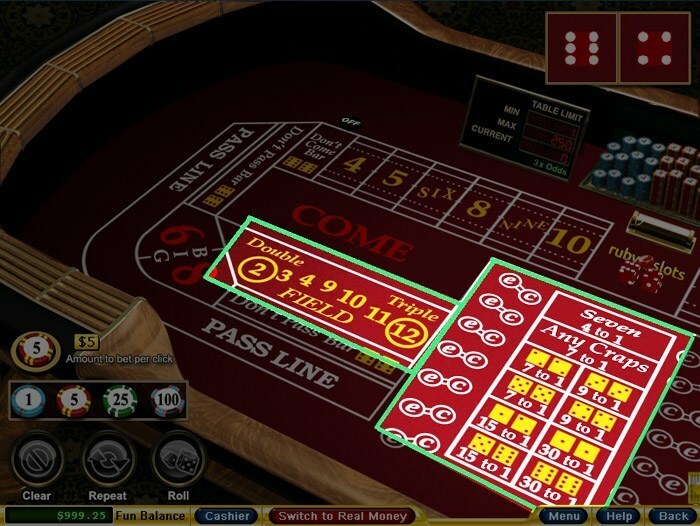 There’s a download casino offering crisp graphics that you can enjoy from your home computer as well as instant-play options allowing you to connect via your tablet or smartphone. Many players like to try their hand at all kinds of contests and games, and William Hill has almost everything you need in an online wagering firm. There’s a sportsbook so that you can bet on your favorite teams and a poker room allowing you to pit your skills against other players on the iPoker network. Bingo, arcade games played for money, and financial-market betting round out the product line at William Hill. If you want to learn more, read our William Hill casino review. Humans have been playing games with dice for thousands of years, often using cubes carved out of animal bone. The game we know today as craps was derived from earlier games, which were played in the early 1700s. Around the year 1800, Bernard de Marigny, who was the dissolute, young scion of a wealthy Louisiana family, was sent to England in an attempt to mend his profligate ways. The attempt failed – Marigny spent most of his time in England gambling, and he returned to Louisiana with an appreciation of the English dice game Hazard. Combining this game with others that were being played at the time, he created a game that would be recognizable to any craps player today.